The Phase I of the Open Season 2017 for the Baltic Pipe project revealed an existing interest in the realisation of the Baltic Pipe Project and confirmed sufficient demand for gas transportation from the North Sea through Denmark and the Baltic Sea to Poland. Based on evaluation of the results of the Phase I of the Open Season 2017 initiated in June, Danish and Polish gas transmission system operators, Energinet and GAZ-SYSTEM, will now continue the next activities for the implementation of the Baltic Pipe. Both Energinet and GAZ-SYSTEM will proceed with the necessary technical, environmental and economic studies and surveys to be able to initiate the construction of the gas pipeline if a positive investment decision is taken in 2018. The next milestone in the Baltic Pipe Project is the initiation of the second binding phase of the Open Season 2017, which will be launched on September 5, 2017. As a result of this phase, the shippers are expected to commit to 15-year contracts for capacity. 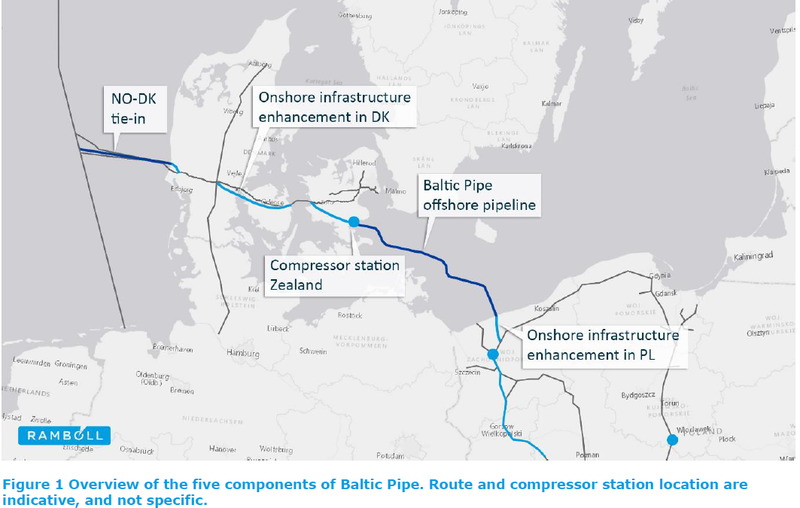 The Baltic Pipe Project is a major gas infrastructure project that aims at creating a new supply corridor for gas in the European gas market. The project will enable transport of gas directly from Norway to the markets in Denmark and Poland together with their neighboring markets. Moreover, it will also enable shippers to flow gas bidirectional from Poland to the Danish and Swedish markets, and thus allow Denmark and Sweden access to Liquefied Natural Gas (LNG) through the LNG import terminal in Poland. The Baltic Pipe is recognised as the EU ‘Project of Common Interest’ (PCI) project and has the purpose to further strengthen the European internal energy market by reaching the EU’s energy policy objectives of affordable, secure and sustainable energy. A Danish upstream tie-in from the Norwegian system in the North Sea to the Danish landing point (the “Norwegian tie-in”). Expansion of the existing west-east capacity in the Danish onshore transmission system (the “Danish Expansions”). Compressor Station Zealand located on the Danish shore (“CS Zealand”). A transmission offshore pipeline between Denmark and Poland, from Southeast Zealand through the Baltic Sea, and the receiving terminal and onshore pipeline to connection to existing transmission system in Northwest Poland (the “Offshore Interconnector”). Expansion of Polish transmission system (the “Polish Expansions”). What is Open Season? A bidding process whereby Energinet.dk and GAZ-SYSTEM S.A. invite companies in the gas market to submit bids for capacity in Baltic Pipe. The companies must submit financially binding bids and thereby acquire capacity – to transport gas through the pipes – for 15 years. The Open Season procedure aims to determine whether – as the preliminary analysis shows – the connection is financially viable.